Ron Canlin started the Chambers of the Black Hand in 1996 and it took 6 months to dig to the opal level of 60 feet for the purpose of showing visitors the opal mine. Over the past 18 years, he hasn't stopped. At this point the carvings were not even thought of but after the first year of unofficial business showing a few people the mine I decided to dig a Little extra room at the 35 foot level to give visitors a demonstration of opal cutting. As the sandstone was excavated for the new room I decided to carve a welcome on the wall and the Chambers of the Black Hand was born. One carving led to another and then when one room was completed the next room was excavated to allow for more carvings. With the passing of time and practice I decided on bigger themes like the Egyptian room, animal room etc, I then decided on “David” and the story goes on. The Big Budda turned into three big buddas and many more Ideas waiting to be born. My intention is to make the Chambers bigger and as time goes on I will continue to carry on carving either my ideas or requests from our visitors who have in the past given me good ideas.. WHEN Ron Canlin bought an unwanted mine in Lightning Ridge in 1982, he dreamt of making a fortune by uncovering rich seams of precious stone. 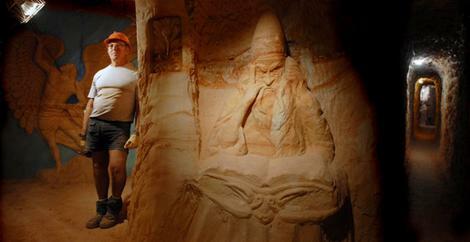 These days the 66-year-old miner's imagination is filled, not with glittering opal but with the angels, goblins and religious figures he carves into its sandstone walls. As a source of opal the mine was a flop - yielding just $27,000 in 25 years of toil. But the endless supply of bare sandstone has proved to be the perfect canvas for a form of sculpture that is attracting tourists from across the country. "It became pretty clear that it was going to be a bread-and-butter mine - one that just keeps giving you bits and pieces but nothing more," Canlin said. "So about 10 years ago I started thinking about turning it into an open mine for tourists. I built some stairs and carved a little welcome hand in the stone to greet the visitors. "I just thought 'this is wonderful!' I've always been a bit arty and it just jumped out at me." Using the tools of his trade - a jackhammer and pickaxe - and a few kitchen utensils, Canlin turned his seemingly worthless mine into an eclectic underground sculpture gallery. The result is The Chambers of the Black Hand, a set of catacomb-like rooms where dinosaurs, goblins and wizards and figures such as Nostradamus and the Archangel Gabrielle emerge eerily from the walls. "I just go through books, encyclopedias, newspapers looking for pictures that appeal to me," Canlin said of the inspiration behind his work. "I did the Last Supper as a bit of a challenge and an Egyptian room for a bit of a giggle and it went from there." Having found a picture, Canlin digs out a new space in his mine with a jackhammer, renders a wall and then begins carving the relief with a small pick. The fine work is done with cutlery from his kitchen. "The sandstone is perfect for this kind of work - it's stable, but very malleable. "I really feel it was fate that it worked out this way. You could have knocked my down with a feather if you'd told me 25 years ago that this is what I'd be doing."